KIEV, Ukraine -- Five workers were killed and 20 sickened by leaked ammonia at one of Ukraine’s biggest mineral fertilizer producers Tuesday, even after hundreds had been instructed to put on gas masks and evacuate. Smoke stacks of the Donetsk Stirol plant. 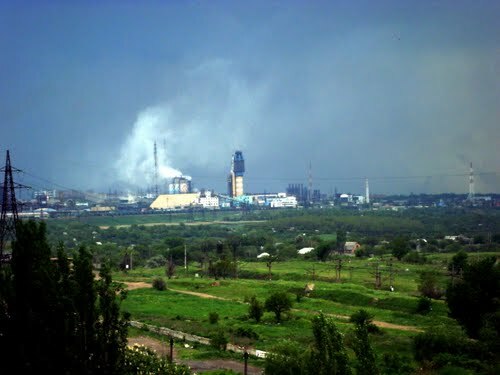 A cloud of ammonia covered a big part of the Stirol company in Donetsk region as rescue crew teams worked for hours before the leakage was stopped. “Immediately after the accident and because of the ammonia cloud the workers were ordered to wear gas masks,” Channel 5 television reported, citing the company’s employees. The emergency services team has taken the situation under control almost seven hours after the initial blast, according to the report from the government. “Preliminary data indicate that there was a rupture of a liquid ammonia pipeline that had caused the blast,” the local prosecutor's office reported. Deputy Prime Minister Yuriy Boyko is leading a special government commission to investigate the accident, according to the report. Stirol is one of Ukraine's biggest mineral fertilizer producers and is part of a business empire Ostchem Holding, owned by billionaire Dmytro Firtash. Ostchem’s other assets include Ukrainian producers of nitrogen fertilizers Severdonetsk Azot, Cherkasy Azot and RivneAzot, but also Nitrofert in Estonia and TajikAzot in Tajikistan. Stirol is expected to produce 644,300 mt of ammonium nitrate, 99,300 mt of urea-ammonia compound, 4,700 mt of sodium nitrate and 1,300 mt of sodium nitrite, according to the company. Stirol is also Ukraine’s only producer of polystyrene. It increased output 0.9% year-on-year to 8,482 metric tons of polystyrene in January-June, up from 8,408 mt produced in the same period a year ago, according to the state statistics committee. Polystyrene is used in production of plastic goods and packaging, but also in food industry, medicine, machinery and other sectors of the economy. Stirol has an annual capacity to produce about 50,000 mt of the commodity. The company is exporting most of the output. In 2012 Ukraine produced 18,402 mt of polystyrene, down 11% from 20,675 mt in 2011, according to the committee.